Everyone knows the Eiffel tower, the symbol of Paris and of France. In a way, the Eiffel Tower (1889) is symbolic of the metallic architecture, characteristic of the second part of the 19th century, when Paris regularly organized World Fairs, during which all international and technological new trends were presented. But 35 years before the tower, a less famous construction – but no less interesting at all – witnessed this new “Iron Age”: the church Saint-Eugène Sainte-Cécile, located in the former working-class Faubourg Poissonnière. Built in 20 months only, in an ogival style (it’s an example of Gothic Revival in Paris), it is the first church in France with a fully metallic structure (except the 4 main walls, built in masonry), as you can check if you knock on one of the numerous slender and colored columns… The use of metal not only reduced the costs considerably, but its strength allowed the columns and walls to be thinner, which increases the impression of space and lightness when you get inside. It also made the use of flying-buttresses, those structural elements typical for Gothic Art, that you can see at Notre-Dame or Saint-Séverin, unnecessary. 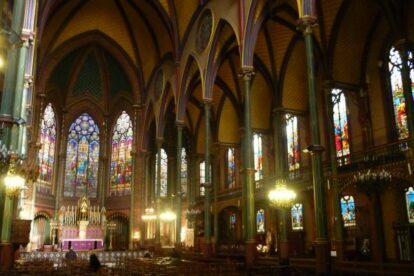 Many elements of the decoration (stained glass windows, organ, spiral staircases at the angles…) are also worth a look: they were all presented at the first Paris Expo in 1855, at the time of Haussmann’s Renovations of Paris. Last but not least, the church is often empty and quiet.